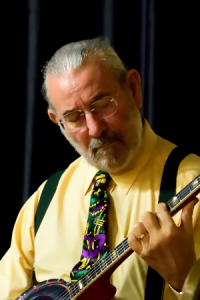 LOUIS LINCE (banjo/guitar) is very much in demand as a Reviewer and Publisher. His exceptional banjo/guitar playing is a great contribution to Mart Rodger Manchester Jazz and will be something very special for our listeners. Moving from the North West to London in 1958, he was a semi-pro musician with Mac’s New Orleans Band, the Dave Bailey Trio and the Savoy Jazzmen. He also played and recorded with the Ken Colyer All-Star touring band. Louis was a full-time musician from 1988, having formed Louis Lince’s New Orleans Band, then was a member of Monty Sunshine’s Band until Monty’s retirement in 2000. Louis relocated back to the North West in 2002 and played with Martin Bennett’s Old Green River Band before joining the Savannah Jazz Band, which he left recently. He is a regular visitor to New Orleans and is well-known there. He is also to be heard on many recordings.